Jackson studies psychology at Oklahoma State in addition to her coaching duties. Jackson reached a career-high ranking of No. 45 when she competed on the pro tour. After a successful pro career that saw her achieve a ranking as high as No. 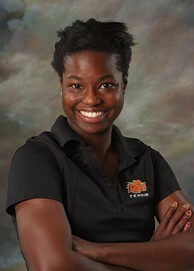 45 in the world in 2006, Jamea Jackson has turned her attention to coaching and is now the assistant coach for the women's tennis team at Oklahoma State University. Jackson is quickly making a name for herself among the coaching ranks and has served as the USTA Women's Collegiate Summer Team coach the past two years, where she works with 12 of the top collegiate athletes from around the country. During her playing career, Jackson played in all four Grand Slams, competed for the U.S. Fed Cup team and posted wins over top-50 players, including Maria Sharapova, Jelena Jankovic and Marion Bartoli. She recently took time to answer questions for USTA.com about how she ended up at Oklahoma State, what she feels are the benefits of attending college and much more. USTA.com: What is your favorite aspect of college tennis? Jamea Jackson: I really appreciate the team atmosphere. I think that is what most people involved in college tennis value the most. Coming from juniors and the tour, I was very used to tennis being very individual, so having a team that travels everywhere together and playing as one entity makes the experience extra special. 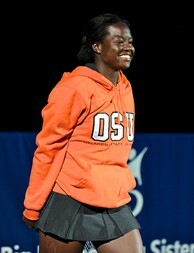 USTA.com: How did you end up at Oklahoma State? Jamea Jackson: The position opened up around the same time I retired from the tour. The head coach, Chris Young, and I had various people in common, and when he was looking for an assistant, my name was mentioned. I came out, loved the school and signed on the dotted line the same day. USTA.com: What advice would you give student-athletes going through the recruiting process? Jamea Jackson: Educate yourself thoroughly. Although I made my decision very quickly, it is important to educate yourself on the school, the coaches, the team, your major, etc. You should have a pretty good idea of what you are signing yourself up for when you commit to a program. Also, be honest with the coaches you are talking with. We understand that you have to make the decision that is best for you. We appreciate and admire the kids who are up front from the beginning. Lastly, don’t forget to enjoy the experience!! USTA.com: What do you see as the biggest challenges that students face when they arrive on campus? Jamea Jackson: It really depends on the background of the students. With kids who have homeschooled a lot, the structure takes some getting used to. For those who haven’t trained as much, the fitness really takes a lot out of them. It is important to remember your goals on and off the court during this time so no single aspect of school—the structure, the tennis, the fitness or the social opportunities—overwhelms or distracts you. USTA.com: What do you think are the advantages of playing college tennis? Jamea Jackson: I think college tennis has a number of advantages. It gives young players an opportunity to go to an excellent university and prepare themselves for life after tennis. For players considering hitting the tour after school, it gives them every resource they could need to get better, as well as a chance to mature away from home and take responsibility for their development. USTA.com: Describe a typical day in the life of a student-athlete? Jamea Jackson: Our girls typically start out their day with fitness from 7-8 a.m. They attend their respective classes until team practice at 2. Twice a week, they have an individual with either Chris or me during this 8 a.m.-2 p.m. time period. After practice, the girls have some free time, and their activities vary. Some nights they hang out with friends, some we have study hours together. They also meet with tutors and study and complete homework and projects on their own in our Academic Center. It can be a grind, but it’s a ton of fun, and you can’t beat the excitement of a college tennis match. USTA.com: For players who are struggling with the decision of whether to attend college or turn pro, what would you say are the benefits of attending college? Jamea Jackson: It is impossible to name all of the benefits of attending college. The free (or reduced-cost) education, the life-long friends you will make and the college tennis atmosphere are just a few of the benefits that you will get in college. You will also have the opportunity to achieve scholastically, to meet people from completely different walks of life and to immerse yourself in new, exciting things. If the writing is not on the wall for you to turn pro, college should be a very serious consideration. USTA.com: For the past two years, you have been a coach for the USTA Collegiate Team. Can you talk a little bit about that experience? Jamea Jackson: The experience of coaching the collegiate team has been amazing. Basically, the USTA Collegiate Team is made up of the best American collegiate players. They are supplied with a travel grant for tournament play and two college coaches who travel to each tournament with team members. It is all about taking our best players from the college level, showing them the ins and outs of the pro tour and teaching them what they will need to do individually to be successful at the next level. Each year we have had very talented players as team members, and they’ve improved drastically as the summers progressed, which is what it is all about. USTA.com: You are currently pursuing your degree at Oklahoma State. What are you studying? Is it challenging to meet the demands of being a full-time student and full-time coach? Jamea Jackson: I am pursuing a psychology degree at Oklahoma State University. It is definitely challenging to do both and requires some serious time management, but, as I remind my players, it’ll be worth it in the future!